“We recognize that adding solar panels can be expensive, which is why we offer to have the solar panels installed with no out-of-pocket expenses to the homeowner, while passing along energy savings to them,” said Tony Twomey, COO of SkyBlue Solar. SkyBlue Solar is offering a new way for homeowners to save money on their power bill and protect the environment without emptying their pockets. The company provides homeowners with the opportunity to save up to 40 percent of what they’re currently paying on their electric bill by having solar panels installed on their homes without having to pay for any out-of-pocket costs. SkyBlue Solar is able to provide this option by utilizing the government sponsored Power Purchase Agreement program, and the system comes with a 20-year monitoring, maintenance and repair program. While homeowners can pay to install solar panels on their own, SkyBlue Solar offers homeowners the option to install solar panels with no money down. 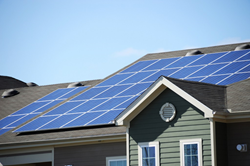 This allows the homeowner to pay for the solar panels over time through their electric bill with no additional costs, which can create a savings of up to 40 percent less than what they’re currently paying each month. “We recognize that adding solar panels can be expensive, which is why we offer to have the solar panels installed with no out-of-pocket expenses to the homeowner, while passing along energy savings to them,” said Tony Twomey, chief operating officer of SkyBlue Solar, which serves homeowners in New Jersey, Massachusetts and California. Besides saving money, homeowners with a medium size house can expect to remove approximately 9,200 pounds of toxic pollution each year, Twomey said. The owners of American Power & Gas, which was listed as the fastest growing company in Tampa, Florida by the Tampa Bay Business Journal in 2016 and one of the fastest growing companies in Florida, helped create SkyBlue Solar because of their dedication to having a positive impact on the environment.